On November 6, South Dakota’s governor Michael Rounds declared a state of emergency as heavy snow blanketed the state and threatened all parts of it – including Native American reservations. They, however, were excluded from his declaration. They’ll get no badly needed help, and it’s an all too familiar story for our nation’s original inhabitants. They’ve been abused and slaughtered for over 500 years. At Mabila, Acoma Mesa, Conestoga, the Trail of Tears, Pamunkey, Mystic River, Yellow Creek, Sand Creek, Gnadenhutten, and Wooded Knee. At far too many other places as well at a cost of many millions of lives, now forgotten and erased from memory. Worst still, our Native people continue to be systematically repressed and mistreated. They live in poverty and despair. They’re mocked and demonized in films and society as drunks, beasts, primitives, savages, and people to be Americanized or warehoused on reservations and forgotten. Their cultures are willfully denigrated. Their legacy is one of millions slaughtered, betrayal, treaties made and broken, stolen lands, rights denied, and welfare criminally ignored to this day. In a commentary titled “Broken Promises & Laws,” it describes a Broken People whose lands were stolen, buffalo massacred, people slaughtered, and who were herded onto reservations in violation of Treaties successive US governments signed and then abrogated. It stated that “The government of the United States desires peace, and its honor is hereby pledged to keep it.” It also re-affirmed all rights the Indians were granted under the 1851 Treaty. Those rights and all others were abrogated and denied. 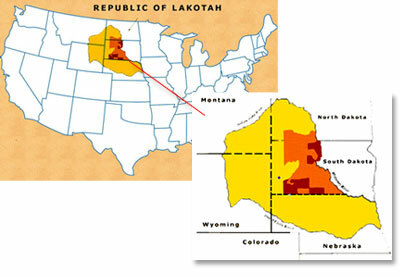 Western North and South Dakota Lakotahs are one of seven Sioux tribes comprising the Great Sioux Nation and are best known by their redoubtable leaders – Sitting Bull, Crazy Horse, Red Cloud and Black Elk, among others. Names even young school children know but not their heroic feats and the great price they and their people paid. In 1874, General George Custer invaded the most sacred Lakotah territory, the Black Hills (Paha Sapa), and with him came gold seekers. An illegal occupation followed along with billions of dollars of stolen resources and great numbers of lives lost. All in the name of progress to colonize the continent’s West. All at the expense of our Native peoples who lost everything as a result. “This Constitution, and the Laws of the United States which shall be made in Pursuance thereof; and all Treaties made, or which shall be made, under the Authority of the United States, shall be the supreme Law of the Land” – binding without qualification on the executive, legislature and judiciary. — Native Americans on reservations aren’t entitled to the same constitutional rights (like free speech, religion, assembly, and due process, etc.) as other Americans even though they’re legal citizens; non-Indian people when on reservations (so-called “tribal trust status lands”) also relinquish these rights while there; in addition, “tribal sovereignty” benefits leaders alone, not their people, and tribal chiefs get their authority from the Interior Secretary and US-run Bureau of Indian Affairs (BIA). “Tribal sovereignty” is a profound misnomer. It belies any sense that Indians on reservations are self-governing. They are not. There are no checks and balances, no separation of powers, no constitutional protections, and the US government owns the lands as federal territories – under “plenary power” in trust status. In 1978, the Supreme Court ruled that Indian tribal chiefs and councils (not US law) have full authority over their people, and these “governments” are empowered by Washington. Indian tribes are beholden to the government for help and need permission for most everything they do. Their people on reservations remain warehoused, abused and forgotten. The notion of “sovereignty” is another indignity, a charade, and silent outrage against our proud original inhabitants. Out of sight and mind in tribal “homelands,” no different than South Africa’s former bantustans and equally oppressive. To this day, Native Americans and the Lakotah people are victims of what Ward Churchill calls “A Little Matter of Genocide” that he explained in his book by that title. It’s from American Indian Movement founder, Russell Means, who spoke of “a little matter of genocide right here at home” by which he meant a process still ongoing. “the destruction of a nation or of an ethnic group” that corresponds to other terms like “tyrannicide, homocide, infanticide, etc.” Genocide “does not necessarily mean the….destruction of a nation, except when accomplished by mass killings….It is intended….to signify a coordinated plan (to destroy) the essential foundations of the life of national groups” with intent to eradicate or substantially weaken or harm them. “Genocidal plans involve the disintegration….of political and social institutions, culture, language, national feelings, religion….economic existence, personal security, liberty, health, dignity, and” human lives. “any (acts like those Lemkin cited) committed with intent to destroy, in whole or in part, the national, ethnical, racial or religious group (by) killing (its) members; causing (them) serious bodily or mental harm; (or) deliberately inflicting (on them) conditions” that may destroy them in whole or in part. Destroying peoples’ cultures, preventing them from practicing their religion, speaking their language, and/or passing on their traditions to new generations are acts of genocide. “The Congress shall have power to….provide for…. (the) general welfare of the United States” – the so-called welfare clause for all its citizens. Before early Europeans arrived, the Americas (North and South by expert estimates) were home to over 100 million indigenous peoples. From 1492 to 1892, US Census Bureau figures showed less than 250,000 survived. Or put another way – white Europeans committed the greatest ever genocide that was rivaled only, but not equaled, by the one against black Africans who were stolen into slavery for the “new world.” Millions of them died during capture and the Middle Passage. Our Native peoples in even greater numbers – victimized by ritual slaughter. By being hacked apart, buried alive, trampled under horses, hunted as game and fed to dogs, shot, beaten, stabbed, and even scalped for bounty or as trophies. They were also hung on meathooks like beef, thrown into the sea from ships (the way blacks were), worked to death as slaves, starved, frozen to death during forced marches and internments, and infected with deadly diseases. Our disturbing “civilization” that’s untaught in American schools, and when it is Indians are the villains and the settlers their victims. History on its head the way Hollywood portrays it and still does. “Distinctions….between right, center, left and extreme left in the US are quite literally nonexistent on the question of genocide of indigenous peoples. From all four vantage points, the historical reality is simultaneously denied, justified, and in most cases celebrated (or just forgotten. But preposterous as these arguments are, all of them are) outstripped by a substantial component of zionism which contends not only that the American holocaust never happened, but that no ‘true’ genocide has ever occurred, other than the Holocaust suffered by the Jews” in Nazi Germany. It’s an all too familiar pattern of historical revisionism or denial to view one people’s ordeal as important, preeminent or unique and another’s as non-existent – depending, of course, on who suffered and who caused it. After WW II, Zionist Jews copyrighted Hitler’s genocide, rebranded it “The Holocaust,” framed it as a one-off event, and created the myth of unique Jewish suffering. It refers to “fantasy” US history about the purported French sale of 530 million acres for a mere $15 million – part of which belonged to Lakotahs who weren’t consulted or consented to the transaction. The first “peace and friendship” treaty followed in 1805. Like others later on, it was systematically ignored and violated as settlers invaded, encroached, and occupied Lakotah lands. Throughout the 19th century, the US government “engaged in multiple military, legal and political strategies….to deny Lakotah our right to freedom and self-determination.” Even after the Supreme Court’s 1883 Ex Parte Crow Dog decision, it persisted. The Court recognized Lakotah freedom and independence in ruling that tribes held exclusive jurisdiction over their internal affairs. It didn’t matter as in 1885 Congress passed the Major Crimes Act to extend US jurisdiction into Lakotah territory, and more egregious actions followed. One was the 1903 Supreme Court Lone Wolf v. Hitchcock decision that recognized near absolute plenary congressional power over Indian affairs, virtually exempt from judicial oversight. It was an outrageous ruling to let the government freely expropriate tribal lands and resources on the pretext of fulfilling its federal trust responsibilities. Quite simply, it empowered Washington and rendered Indians impotent over their own internal affairs, with no rights of any kind without Washington’s permission. — teenage Lakotah suicide is 150% higher than the US national average. — most families can’t afford heating oil, wood, propane or any way to heat homes. — government funding for job creation is lost through cronyism and corruption. — an estimated 17 people on average live in each family home – many with only two or three rooms; some homes built for six to eight people have up to 30 living in them. — alcoholism affects 90% of families. — the Federal Commodity Food Program provides sugar-rich foods that cause high rates of diabetes, heart disease, and other preventable illnesses and diseases. — most Indians live on reservations that are supposed to be self-governing – in principle, that is; around 2% of Indians live under state jurisdiction. — the Lakotah language is forbidden to be taught in US government schools – a further indignity inflicted on the people. In September 2007, the UN General Assembly adopted the United Nations Declaration on the Rights of Indigenous Peoples. It passed 143 – 4 with only Australia, New Zealand, Canada and the US voting “no.” Eleven nations abstained. This document concluded 25 years of “contentious negotiations over the rights of native people to protect their lands and resources, and to maintain their unique cultures and traditions.” In that and the above stated respects, it’s historic and important. Nonetheless, America has its own “traditions” over and above those of others it disdains and abuses – the poor, non-whites, the disadvantaged, labor, non-Jews and Christians, virtually everyone outside its white supremacists elites, and clearly its Native peoples from the earliest settlers to the present day. Nothing’s changed from then to now – Broken Promises, Broken Laws, Broken Treaties, and Broken Hope for a Broken People suffering hugely in the United States of America – out of sight and mind and not an issue for the dominant news media. Very much one for people who care. Also visit his blog site at www.lsjlendman.blogspot.com and listen to The Global Research News Hour on RepublicBroadcasting.org Mondays from 11AM – 1PM US Central time for cutting-edge discussions on world and national topics with distinguished guests. All programs are archived for easy listening.